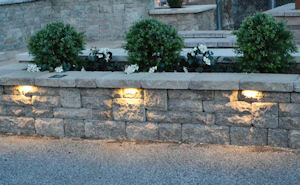 The iluma Hardscape Retrofit Lighting System helps enable quick and easy installations with existing hardscape applications, ranging from masonry and retaining walls to outdoor kitchens, pillars, columns and complete landscapes. Using proprietary LED Lighting Simplified connection technology, the system features sleek and easily concealed 5mm wiring. It’s available in several configurations, including standard or customizable lengths with an option of 3-, 6- or 9-in. light strips spaced evenly apart.